A healthy ecosystem can provide a variety of crucial services for public goods, such as clean water, nutrient cycling, climate regulation and food security services that contribute directly or indirectly to human well-being. Yet today, many ecosystems are in decline; this is of particular importance to agriculture, which depends on ecosystem services. Loss of healthy ecosystems will seriously affect the production of food, both today and in the future. 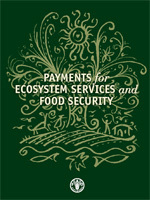 Payments for Ecosystem Services (PES) is an economic instrument designed to provide positive incentives to users of agricultural land and those involved in coastal or marine management. These incentives are expected to result in continued or improved provision of ecosystem services, which, in turn, will benefit society as a whole. The designations employed and the presentation of material in this information product do not imply the expression of any opinion whatsoever on the part of the Food and Agriculture Organization of the United Nations (FAO) concerning the legal or development status of any country, territory, city or area or of its authorities, or concerning the delimitation of its frontiers or boundaries. The mention of specific companies or products of manufacturers, whether or not these have been patented, does not imply that these have been endorsed or recommended by FAO in preference to others of a similar nature that are not mentioned. All rights reserved. FAO encourages reproduction and dissemination of material in this information product. Non-commercial uses will be authorized free of charge, upon request. Reproduction for resale or other commercial purposes, including educational purposes, may incur fees. Applications for permission to reproduce or disseminate FAO copyright materials, and all queries concerning rights and licences, should be addressed by e-mail to copyright@fao.org or to the Chief, Publishing Policy and Support Branch, Office of Knowledge Exchange, Research and Extension, FAO, Viale delle Terme di Caracalla, 00153 Rome, Italy.